Just who is Cadeyrn Neville? Good question. He’s a big unit, all 202cm of him (a tick under 6ft 8), stopping the scales at 120kgs. And he’s 23. But Neville has made a meteoric rugby rise in just two years, after a representative rowing career with the Australian Institute of Sport. Rarely does a forward take off like that. Most have been playing rugby ever since they were out of nappies. What Neville has achieved in two short years is extraordinary. 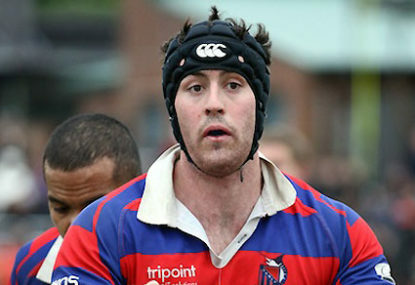 Born and bred in Manly, Neville had to play with the Marlins when he made the switch. That goes without saying. Last night, Neville made his Super Rugby debut with the Melbourne Rebels against the Bulls at AAMI Park. And it was memorable. Not only did Neville more than hold his own against a powerhouse pack led by Springbok Pierre Spies, but the Rebels went within a whisker of causing the biggest boilover of the season before going down 41-35 to a far more experienced lineup, giving the 12,112 crowd plenty to cheer about when nobody expected the two-wins this season Rebels to match it with the two-loss Bulls. There’s no such thing as a good loser, but the Rebels played out of their skins in arguably the franchise’s best performance since they were admitted last season. And Neville was right in the thick of it. It was not only Neville’s debut, but also Andrew Lees’ as a Super referee. No meteoric rise for the Australian who cut his teeth as a whistler in Sydney’s Shute Shield and the IRB’s Sevens circuit. It’s been a tough grind to be recognised by his territorial peers, but he’s at last broken through the barrier. Like Neville, Lees’ first up appearance was memorable. Memorable also for Mark Gerrard’s 100th Super cap through a combination of Waratahs (2 caps), Brumbies (77), and 21 with the Rebels. He’s been a great servant of the game and will continue to be just that. And a welcome back to Stirling Mortlock from the Rebels bench for his 139th cap. The former Wallaby skipper injured a calf muscle so severely pre-season he wasn’t even able to train for long periods. But last night, Mortlock showed he’d lost none of his old skills. He’s probably a metre or two slower around the park, but he has football brains to burn, and a perfectly timed pass to Mitch Inman late in the game produced Cooper Vuna’s second try. There were plenty of them with five apiece, and perfect goal-kicking from both sides – Morne Steyn’s 7 from 7 for the Bulls, and Kurtley Beale’s 5 from 5 for the Rebels. In fact, the entire 80 minutes produced a lot of cracking rugby, none better than Beale swapping his 15 jersey for 10. He’s the best fullback in the country, and judging by last night, without doubt the best fly-half, especially as incumbent Quade Cooper and stand-by James O’Connor are on the long-term injured list. Beale has an uncanny knack of sighting an opening that doesn’t appear to be there, and he’s gone. As team-mates in the 1980s used to say, “trail Mark Ella”, the same can be said of Beale three decades later. It’s a special gift reserved for few. As brilliantly as Beale played last night, as expected, precious few would have expected Cadeyrn Neville to play so well for one very good reason: the vast majority of rugby fans had never heard of him.